Once you’ve have finished adding to your shopping cart then ‘Proceed to Checkout’. Next enter your mailing and billing address information, your shipping will be calculated, etc. Scroll down past the Order Notes box (leave a comment, if you’d like). If all is correct then enter your payment information and click ‘Place Order’. A second option is to ‘Pay with Paypal’. The ‘Proceed to Paypal‘ button located at the bottom of the page after you chose this option. This redirects you to a secure PayPal website where you enter all your billing info, etc. You have the option to either pay with a PayPal account, or as a guest using whatever payment method you prefer (Visa, MasterCard, American Express, Discover, debit card, eCheck). Your order will then be complete and you will receive a confirmation email from both us and PayPal. If you are able, we prefer that you place an order through our website. Ordering online results in a faster turn-around time for your order, quick communication, easier payment with credit card or PayPal, and easier refunds when necessary. There’s also up-to-date information regarding availability of items, packet sizes, etc. It is also much faster and easier for us to process your order through the website, giving us more time to be in the field growing seed for you. If you would like to pay with cash, check or money order, a mail order is for you. Print off the 2019 Order Form (link below) and fill in the appropriate information including your name, address, and contact information. Be sure to write the packet size, quantity, plant type, variety name, and price for each item you are ordering. Remember to include the appropriate shipping and handling charges for your order. Refunds, not substitutions, will be issued for out-of-stock varieties. You may also use the online shopping cart to make your selections easier, and print your completed ‘Checkout’ page prior to the submitting the order. Please enclose cash (US$), check, or money order for the full amount owed. We do not accept debit or credit card payment for mail-in orders. We also do not accept phone or fax orders. Download the PDF 2019 Order Form. Do note that mail-in orders are processed once a week so there may be a slight delay in receiving your order. For international orders: Please place order through our website and not mail-in as we cannot accept foreign checks or money orders. This includes Canadian checks written in USD. We do not accept phone or fax orders. If you have questions or concerns about an order, we prefer you email us at: questions(at)adaptiveseeds.com. Orders are only shipped via USPS First Class or Priority Mailing. We do not ship with UPS or FedEx. *Due to recent changes with USPS, we’ve had to increase international shipping and handling charges somewhat drastically. Please note that international orders that weigh more than 8 oz may be subject to additional shipping charges. We will contact you via email if this applies to your order. We are able to process international orders and ship via USPS to most countries. However we require that all international orders are made through the website and not mail-in as we cannot accept foreign checks or money orders, including Canada. It is the responsibility of the international purchaser to know the rules of the destination country. We are unable to provide Phytosanitary Certificates due to their prohibitive cost. Because of this, we have encountered problems with customs in a handful of countries, especially those with restrictive rules. Items are typically released once questions have been answered but customs officials can prohibit the release of packages and some have been returned to us. We cannot guarantee that the seeds will arrive, but we guarantee that we will send them. You may want to place a test order first with a small amount of seed, make several small orders, or ship to a US address and have a friend bring it to you. Please follow the rules of your respective countries. No refunds will be issued for international orders that are undelivered or intercepted by customs. We have successfully shipped to the following countries: Australia; Austria; Belgium; Brazil; Canada; China; Costa Rica; Czech Republic; Denmark; Finland; France; Guatemala; Honduras; Hungary; India; Indonesia; Ireland; Israel; Japan; Mexico; Netherlands; New Zealand; Norway; Portugal; Romania; Slovakia; Slovenia; Spain; Sweden; Switzerland; Taiwan; Thailand; and Turkey. 1/23/19 UPDATE: We’ve had one too many problems shipping to Saudi Arabia and will no longer ship to that country. 2/5/18 UPDATE: An order to Estonia was rejected and returned. 10/11/17 UPDATE: An order to the United Kingdom was destroyed by DEFRA. 6/9/17 UPDATE: An order to Germany was rejected stating that the goods did not meet the criteria of the European Community. 2/9/17 UPDATE: An order to Greece was rejected due to lack of Phytosanitary Certificate. 12/12/16 UPDATE: We have received official communication from the United Kingdom that seed shipments are being rejected or destroyed because they do not meet the UK’s phytosanitary quarantine regulations. The majority of rejected and destroyed shipments are of the following plant types: tomato, corn, common bean, pepper, sunflower, and onion. We are unable to comply with the phytosanitary regulations due to their prohibitive cost. For this reason we discourage orders that ship to the UK, but we will continue to ship there for the time being. 5/25/16 UPDATE: An order to Cyprus was returned to us and occasional orders have been returned from Austria this year. 4/29/14 UPDATE: We’ve been encountering problems shipping into Italy and all packages have been returned to us regardless of type, size or quantity. Our first mailing goes out around the 1st of the New Year. If you’d like to receive a 2019 catalog, use our Catalog Request Form. Don’t forget to include a mailing address with your request. 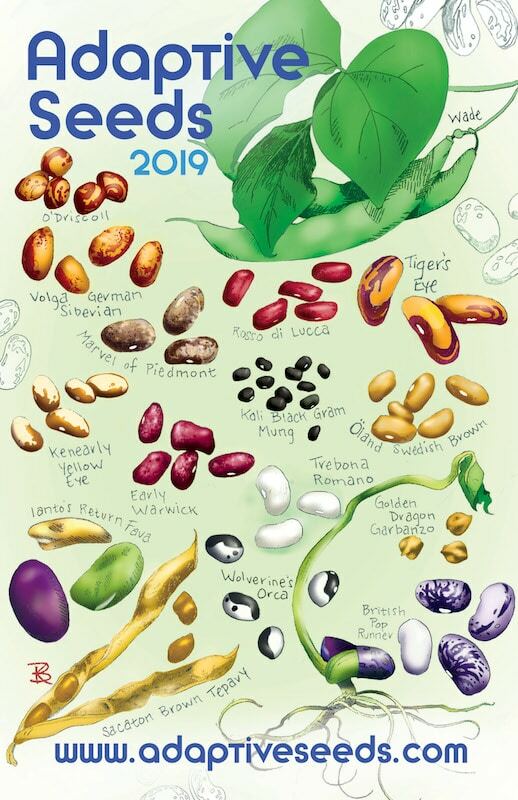 You may also download the PDF of our 2019 Adaptive Seeds Catalog.